GOLD-DRIP dripperline is a black pipe with a blue stripeon top, made up of turbulent flow self-cleaning dripper’ system, which can be used on flat ground or with strong slopes. GOLD-DRIP is particularly suitable for the installation of irrigation systems on multi-annual cultivations such as vineyards, olive groves, fruit trees, etc. It is also successfully used for irrigation of horticultural and floricultural crops, into green house, open field and ornamental green as hedges, flower-beds, public and private gardens. SUPER is the advanced and economical version, with a short 3-hole dripper, for flat ground. 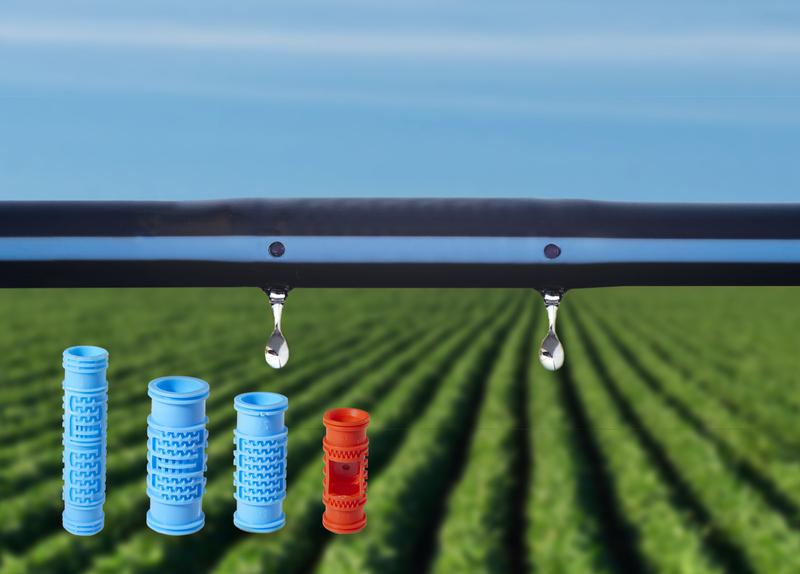 F6 is the 6-hole longer dripper for a more uniform water distribution on soils with a contained slopes and a sandy structure. PC is the 3-hole pressure–compensate short dripper which guarantees constant flow-rate water supply. Recommended for soils with strong slopes. The wide range of models available, makes GOLD-DRIP a versatile and practical product for the making of "DIY" irrigation systems (BRICO GOLD-DRIP Line).